PolyVision® brings learning to life by engaging today’s teachers and students with simple, sustainable, evolving solutions—transforming education into inspired teaching and learning experiences. Our unique solutions include interactive whiteboards, slates, software and accessories that are easier to use, work with any software, and guaranteed to last forever. At ISTE 2011, PolyVision invites you to experience and transform education like never before—to uniquely and completely bring learning to life to any type of learner, wherever they may be. Every day of the show, educators will have the opportunity take in what’s new with PolyVision, current teaching trends and possibly win one of many PolyVision interactive classroom prizes. In booth 1725, PolyVision will be showcasing new interactive classroom solutions that go beyond basics, breaking you free of budget restrictions and giving you the resources for those interactive bells and whistles you’ve been dreaming of. Equipped with a classroom packed full of fun and engaging tools, learners on all levels—auditory, kinesthetic and visual—will be tuned-in. New solutions offered by PolyVision will help you make digital discoveries beyond the boundaries of the classroom. What if going to school meant students could watch giraffes frolic in the Serengeti? Or, they could invite peers from China to participate in their lessons? Visit PolyVision to learn how you can bring learning to life in exciting new dimensions for your students. Go beyond belief with PolyVision’s “next-generation” e - no interactive classroom solutions that you already know and love. Whether it’s in booth 1725 or in one of our curriculum partners’ booths, you won’t want to miss the infinite possibilities e-no brings to teaching and learning. e - no is the only environmentally-certified three-in-one board to combine dry-erase marker, magnets and interactivity—all without cords or cables. It’s multi-touch, multiuser, multi-media collaboration makes learning interactive right out of the box, without costly upgrades or add-ons. e - no works with the software in which you have already invested—and any software you may add in the future. And, the Forever Warranty™ means that you’ll never have to replace the e - no. Ever. No matter the challenges, you are sure to find an e - no no configuration that’s the perfect fit for your classroom. Meet Angela and other educators at booth 1725. 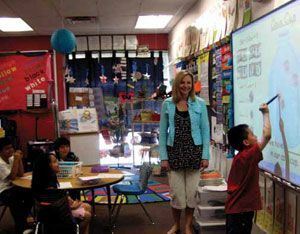 To demonstrate firsthand how teachers and students go beyond boredom with PolyVision interactive classroom solutions, our booth will also feature educators, such as Angela Brotherton, from Pittsburg Primary School. With PolyVision’s technology integration assistance, Angela uncovered a renewed zeal for teaching: “e - no motivated my students and me in ways that I never realized were possible.” Angela will share with you creative methods to build engaging and inspiring digital lessons by incorporating interactive content into otherwise mundane daily activities. Get a sneak-peek at new PolyVision solutions at www.polyvision.com/ISTE2011. Register for ISTE events, attend our grant writing sessions, experience private demonstrations and participate in side-by-side learning (ie. one-to-one professional development! ), where you and a PolyVision education consultant work together in booth 1725 to add interactivity to your existing lessons. Go beyond at ISTE booth 1725. PolyVision puts the learning ball in motion with solutions that help teachers to teach and students to learn. Visit us during ISTE to meet educators like you who already use interactive solutions. Not attending ISTE? Visit www.polyvision.com/iste2011 for more information.